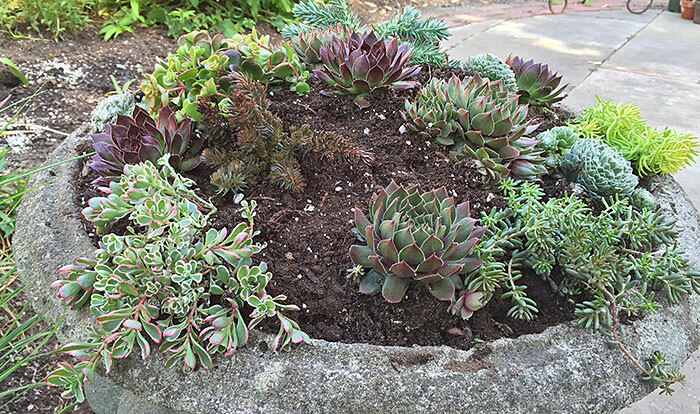 If you’re looking for a simple, easy-care planter that can endure heat and dry spells, consider filling a pot with succulents. I start with an old concrete urn that makes most any plant look good. To ensure good drainage, I add some sand to the potting soil, mounding the soil slightly to show off a mix of low-growing, cold-hardy succulents. In a couple seasons, the plants will fill the allotted space, giving the urn a bejeweled effect. 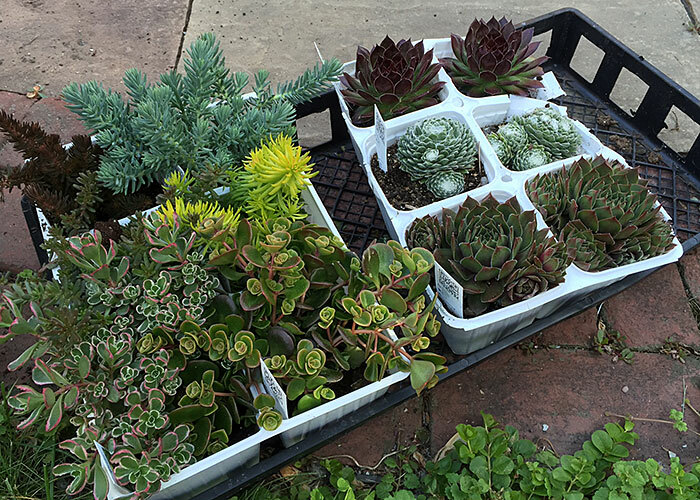 A local nursery offers “variety packs” of succulents — sempervivums and sedums — making it easy to create create varied texture and color. For a different effect, you could stick with a single variety. Last year, I filled the entire urn with bright yellow Angelina sedum — you can still see a piece of it in the new planting. Sempervivums are another good choice. They’re sometimes called hens and chicks because of they way they grow: a large rosette (the hen) surrounded by smaller ones (chicks). I live in zone 5, so I picked plants that are more likely to survive the winter. There are no guarantees, though. Plants growing in a planter are more exposed to cold from all sides. My planting of Angelina sedum was dead this spring, though it had survived nicely in other years. 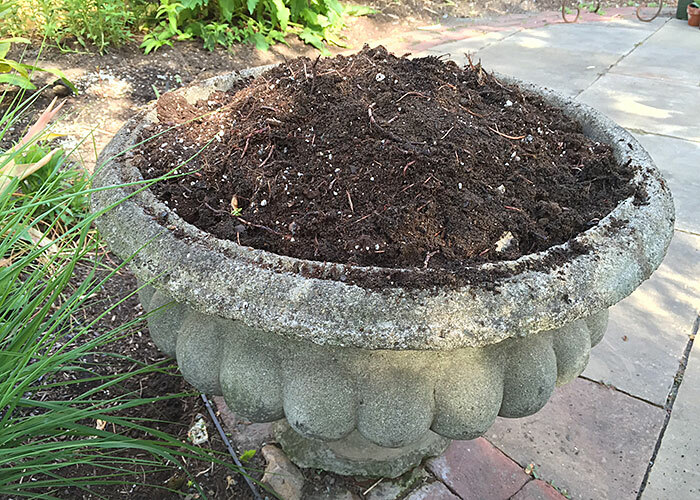 Another option would be to plant in an urn or tray that can be set on the ground and covered with a layer of shredded leaves for the winter. Although there are some areas of exposed soil between the plants, they will fill out considerably after several months of growth. In the meantime, I might mulch the soil with pea gravel, as shown at right. In planters like this, more is better, so pack ’em in! Some of the more interesting forms can be found in plants that are less hardy. For instance, kalanchoe, faucaria and aeonium are weird and beautiful, but not especially hardy. I use them anyway, and bring them indoors for winter, where they make good houseplants. The Viva Dish Planters are perfect for showcasing indoor succulents. David’s winter windowsills are covered with succulents. Peony Lovers: Who Was Sarah Bernhardt? 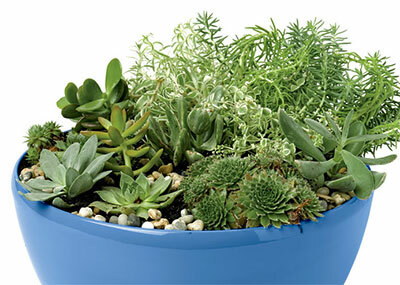 by Kathy LaLiberte – at http://www.gardeners.com/how-to/growing-succulents-in-containers/7020.html – in the first photo shown, there’s a small upright olive-green glaucous plant with long stems and multiple tiny leaves. (This is the address of the image: http://demandware.edgesuite.net/aabf_prd/on/demandware.static/-/Library-Sites-SharedLibrary/default/dwb470a1a0/Articles/Gardening/2014Content/7020-urn.jpg). Please could you identify this plant for me?